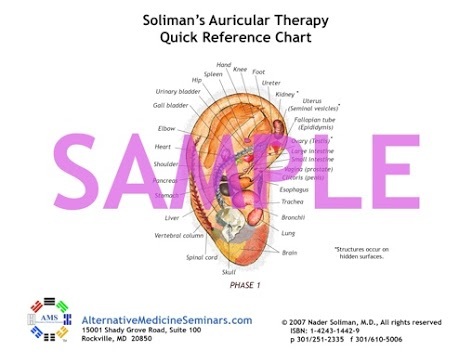 Auricular & Hand Charts – Nader Soliman, M.D. The most accurate auricular charts ever produced to date, are now available to help auricular therapy practitioners identify the projection sites of any organ and structure in any of three phases quickly and accurately. This glossy two-sided 8.5" x 11" and visually pleasing reference charts are the product of years of relentless research by the author to provide the patients with a sophisticated auricular treatment through addressing the pathophysiology at specific locations for acute, chronic, and degenerative conditions. 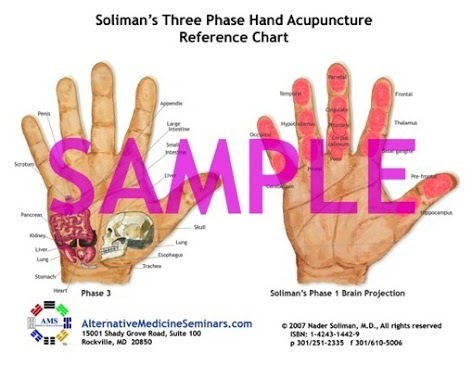 Dr. Nader Soliman utilizing the same principles used by Dr. Paul Nogier in the 1960s (VAS, tissue and color filters) was able to identify three phases on the hand acupuncture microsystem. This glossy two-sided 8.5" x 11" and visually pleasing reference charts will help hand acupuncturists to address the pathophysiology in all three stages of the disease (acute, chronic, and chronic degenerative). This approach guarantees results that will surpass those obtained with treatment through KHT (phase 1) alone. The Chart also provides detailed projection sites of the brain structures in phase 1 (KHT) beyond those presented by Dr. Tae Woo Yoo.